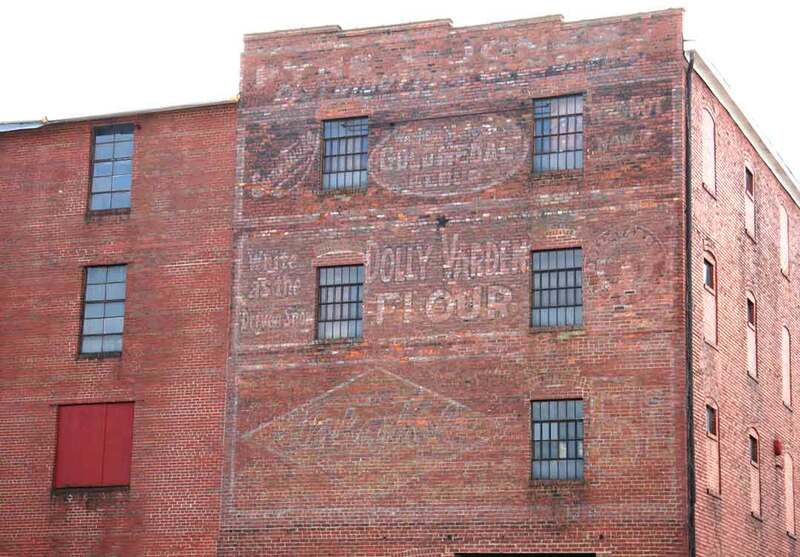 In the cornice, above Gold Medal Flour and Dolly Varden Flour, dim and faded, is Pyne & Jones on this building at 219-221 Bollingbrook St., Petersburg, Virginia. Pyne & Jones were George Clinton Pyne (1883-1962) and Benjamin Whitworth Jones (1889-1959), wholesale grocers and assignment brokers in business in Petersburg approximately 1915 to 1924, and located here on Bollingbrook Street 1918 to 1924. Both George C. Pyne and Benjamin W. Jones were born in Petersburg, and both registered for the World War I draft in 1917 and 1918 as wholesale grocers in Petersburg. They are found in the 1920 U. S. Census living close together on South Adams St. and Central Park (sheet 3B for Jones, the next sheet, 4A, for Pyne). Benjamin W. Jones lived at 230 South Adams St. with his father, a bank president. George C. Pyne lived at 115 Central Park with his family consisting of wife, three children, father-in-law, and sister-in-law. Jones married Hessie Maurice Bobbitt later that year in Blackstone, Va.
By 1930 the business had dissolved. Pyne continued to live in Petersburg. He gave his occupation as "salesman, coffees" in the 1930 U. S. Census. Benjamin Jones was a "salesman, wholesale grocery" in Inverness, Florida. Jones died in 1959 and is buried in Oak Ridge Cemetery in Inverness, Florida. His grave stone reads, "Benj W / Aug 23, 1889 / Nov 3 1959." The Petersburg Progress-Index reported Pyne's death 24 Sept. 1962, "George C. Pyne, Sr., son of the late Marshall W. and Annie Minetree Pyne, died at 2 p. m. Saturday at his home 1005 Vickers Avenue, Durham, N. C. He is survived by his wife, Mrs. Mary Pilcher Pyne; one daughter, Mrs. Clarence H. Cobb of Durham; two sons, George C. Pyne Jr. of Durham, and J. Minetree Pyne of Burlington, N. C., and a sister, Mrs. Edward McDowell of Goldsboro, N. C. Funeral services will be held at 10 a. m. tomorrow at St. Philip's Church in Durham. Burial will be in Blandford Cemetery at 3 p. m." His grave stone reads, "George Clinton Pyne / son of / Annie Minetree & Marshall Pyne / March 22, 1883 / September 23, 1962"
Pyne's father, Marshall William Pyne (1848-1918), kept an art and music store on Sycamore St., Petersburg, from the 1890s until 1918. An obituary notice, in the Baltimore Sun 30 Nov. 1918, read, "Marshall W. Pyne, one of Petersburg's best-known merchants, died at his home on Jefferson street, last night, shortly before midnight, of heart trouble. He was a native of Harpers Ferry, and 65 years old, and had been engaged in the music and picture trade here for many years. He was a member of Blandford Lodge of Masons and a steward in Washington Street Methodist Episcopal Church. He is survived by a widow and two sons and one daughter: Marshall W. Pyne, Jr., of Panama; George C. Pyne, of the firm of Pyne & Jones, of this city, and Mrs. E. D. McDowell, of Wilson, N. C."
Prior to forming Pyne & Jones, George C. Pyne was a salesman at the venerable Petersburg institution of C. C. Alley, Inc., manufacturing confectioners. Founded by Henry Thomas Alley (1822-1875) shortly after the Civil War, by 1882 this business became Charles C. Alley, Confectioner, at 7 North Sycamore St., Petersburg. C. C. Alley was the son of Henry T. Alley, Charles Chapman Alley (1858-1908). Charles C. Alley died as the result of an accident in 1908, as described by the Richmond Times Dispatch 29 January 1908, "Charles C. Alley, one of the leading business men of Petersburg, died at 10 o'clock to-night at the Petersburg Hospital, after several weeks of illness resulting from injuries sustained by falling through a cellar-cap on the sidewalk left open during a fire in Wright's block on Sycamore Street. Mr. Alley was operated upon to relieve injury to the lungs caused by a broken rib. He was forty-six years old and was never married. He is survived by three sisters and two brothers, who are: Mrs. W. W. Warren and Mrs. E. L Baugh, of Petersburg, Mrs. J. H. Thompson, of Norfolk, and W. S. and H. T. Alley, of New York." The Historical and Industrial Guide to Petersburg, Virginia, by Edward Pollock, 1885, includes the following, "Charles C. Alley - The large wholesale and retail Fruit and Confectionery establishment conducted by this enterprising gentleman was founded by his father a quarter of a century ago and has always been regarded as one of the most reliable and responsible business houses in the city. Mr. Alley manufactures all kinds of Candy and Cakes, deals by wholesale and retail in Foreign and Domestic Fruits, Confectionery, Tobacco, Cigars, Toys and Fancy Articles, and has earned an excellent reputation while building up a lucrative trade. He always carries a large and varied stock, and is kept busy the year round filing orders not only in Petersburg and its vicinity, but also in distant parts of Virginia, North Carolina and other states." Following the death of Charles C. Alley, the business was continued by his brother, Walter Scott Alley (1855-1937), his brother-in-law, William Wirt Warren (1851-1914), then his sister, Mrs. W. W. Warren (Ruth Alley Warren (1864-1929), and a newphew, Walter Thomas Baugh (1875-1940). The final listing in Petersburg city directories came in 1937. This ad for Henry T. Alley from the Chataigne & Boyd Petersburg City Directory is dated 1872. This later ad from 1884 shows the name change to C. C. Alley. Many signs advertising Golf Medal Flour are found throughout the U. S., usually with the slogan "Eventually, Why Not Now?" This one is found in West Mansfield, Ohio. There is a clearer Pyne & Jones sign on the side wall of this building near Bollingbrook St. Long after Pyne & Jones, the building was occupied by L. A. Sheffield Transfer & Storage.